Luis De Jesus Los Angeles is very pleased to return to the Dallas Art Fair with a presentation of new and recent works by Dennis Koch, June Edmonds, Nicolas Grenier, Alexandria Smith, and Peter Williams. Primarily working in the medium of drawing, Iowa and Los Angeles-based artist Dennis Koch makes meticulously structured abstract works inspired by the scientific fields of physics, cosmology, dimensional mathematics, and parapsychology. In Koch’s “Versor Parallels”, the properties and relationship of rotating spheres is contemplated further. 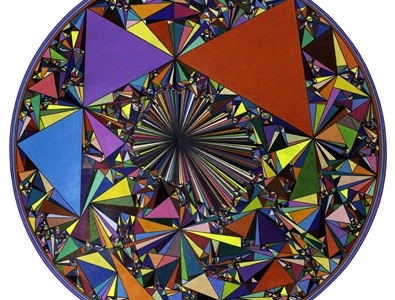 These drawings consist of six vortices within twelve circles that circumscribe an exponential matrix of triangles. This geometry of vortices, circles, and triangles form a prismatic refraction, an analog to the electromagnetic spectrum, which we perceive as visible light. Koch views these works as an allegory for the kaleidoscopic combination of the twelve Jungian archetypes within people or even the cosmological myth of our solar system having once been inhabited by twelve planets. Native Angeleno artist June Edmonds makes abstract paintings that explore how color, repetition, movement, and balance can serve as conduits to spiritual contemplation and interpersonal connection. Edmonds's new flag paintings represent the alignment of multiple identities including race, nationality, gender, and political leanings. The flags have associations with different periods and events in American history and explore its relationship and significance to Black Americans. "Work Harder Flag" comes from a statement made by Stacey Abrams, former Georgia Gubernatorial candidate, in describing what our responsibilities are beyond election days to combat voter suppression and elected officials that don't "share our values". Montreal and Los Angeles-based artist Nicolas Grenier’s interest lies in the distorted connections between the many systems we inhabit—political, economic, cultural andsocial—and the principles (or absence of principles)at the root ofthese systems. His artworks translate thesetheoretical, philosophicalproblems into thevisual or physical. Using the language of architecture, urban planning and diagrams, he imagines absurd or perverse models that are not incongruous with the mechanisms by which organic elements are integrated into structured wholes: households, communities, countries, maps, policies. The result of these explorations could be described as a multilayered critique of society, a social and structural hallucination that hovers between irony, cynicism and political engagement. Wellesly, MA and Brooklyn-based artist Alexandria Smith’s practice is responsive to notions of cultural difference and is defined by a unique relationship to the body. Utilizing her own archive of completed work, she creates new images through a regenerative collage process employing the use of various painting and printmaking methods to create news symbols, systems, and meanings. In her recent works, figures dominate the canvas. 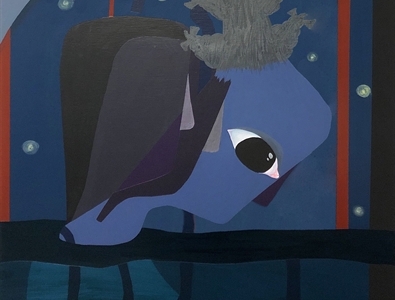 Emerging from and intertwining with graphic and pictorial space, these beings explore concepts of hybridity, duality, and environmental influences on development. The figures are simultaneously mirror images and twins, evoking religious, spiritual, and sexual states of being. Delaware-based artist Peter Williams paints from personal experience, creating bodies of work inspired by communities he has lived in throughout his life including upstate New York, Albuquerque, Detroit, and Baltimore. In his vibrant paintings, Peter tackles the violence of contemporary Black life in America and the myths and heroes that are formed in public perception. Peter states, "my sense of negrossity is one of empowerment," ascribing a studio practice that aims to bear witness to evil while inspiring hope. Peter's work has been featured in the 2002 Whitney Biennial, the 2017 Prospect Triennial, and was inducted into the National Academy of Design in 2018. On his painting "Lost Flag of New Africa," Williams describes "a quilt-like flag of ideas about African textiles, colors, and textures. The mark-making contributes to the feeling of textile. 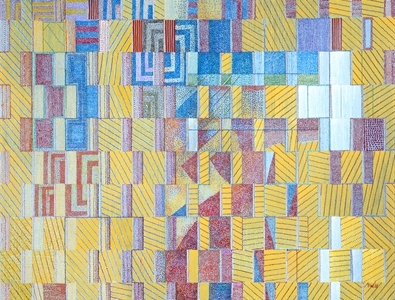 Softer tonal colors are used, and the influence of cubism is apparent; the framework is the grid and the repetition of vertical bars (as in a prison environment). Containment is also a theme, with the yellow color/strips creating patterns of transparency. The optics of the geometry are balanced by latent symbolic forms. A figurative form seems to exist, its boundaries not as defined; symbols and poetics arise in the grid."